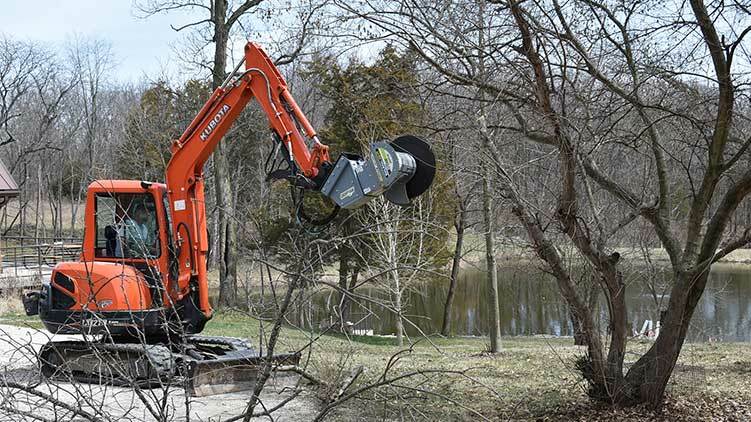 Keep your property well-maintained with DropSaw, the hydraulically-driven tree saw. 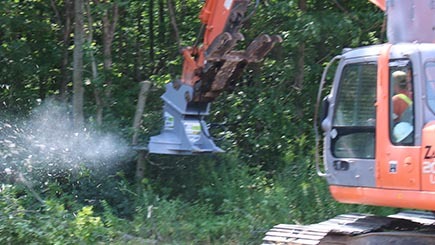 With the DXA530 DropSaw model, a multi angle tree saw for excavators, the cutting head rotates 180 degrees for quick cleaning, trimming and limbing of branches as well as cutting down small trees. 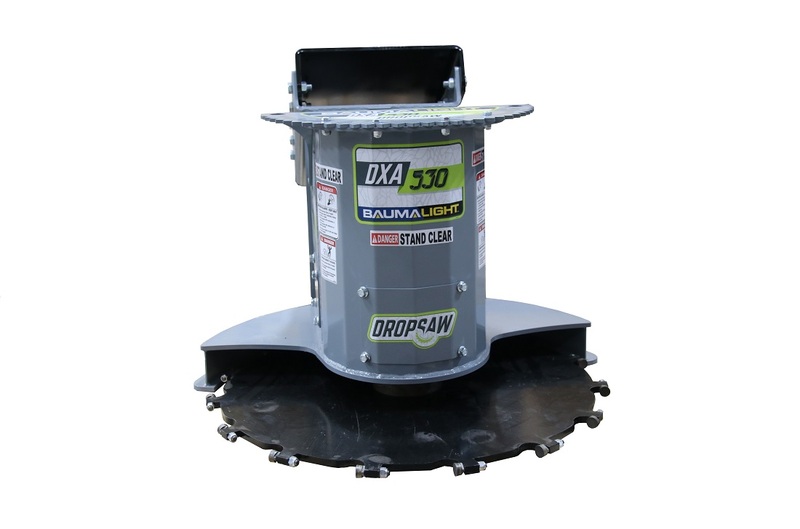 Featuring heavy-duty construction and replaceable carbide-tipped teeth, the DXA530 also offers a circular blade made from abrasion-resistant AR-400 steel. 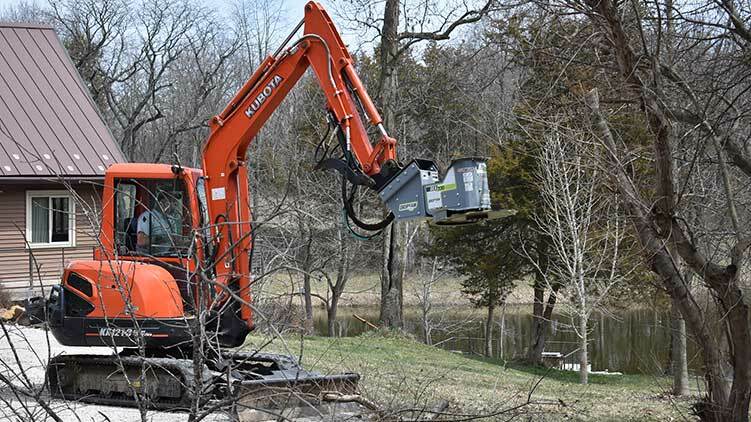 Be sure to visit our excavator mounting section of the website to see how we can help mounting a Dropsaw Tree Saw for you. 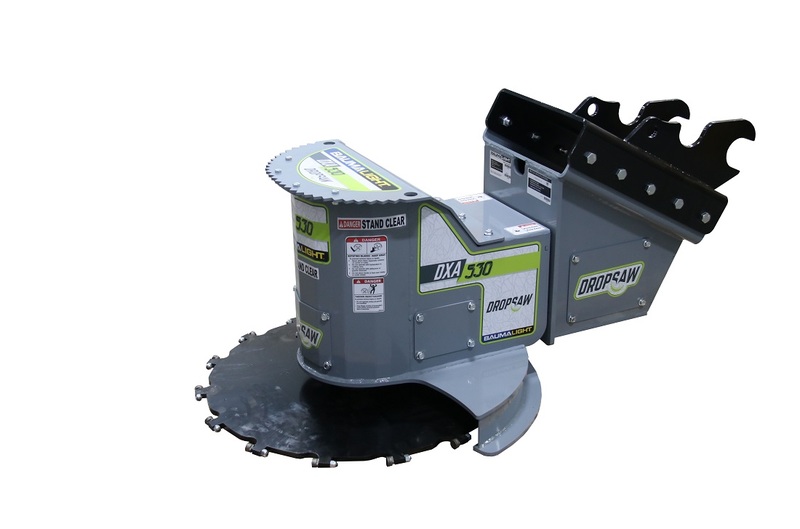 Available with 180º rotating cutting the head, powered by a rotating helical actuator offers precise control for quick, clean trimming and limbing. 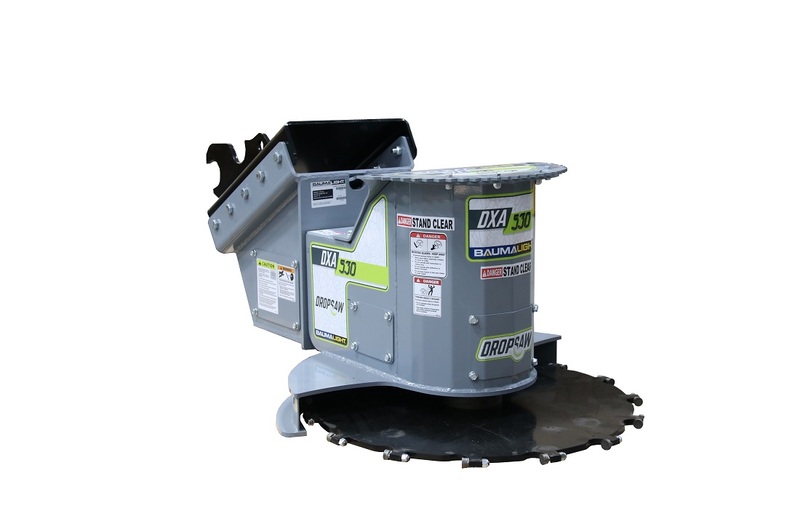 The DropSaw’s durable design and quality materials combine to create a saw that is able to stand up to the demanding work of cutting limbs and trees. 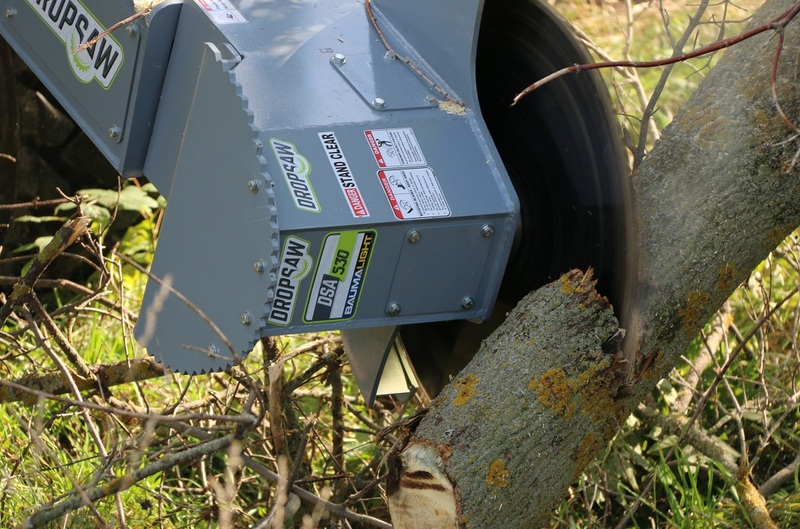 DropSaw's blade is mounted on an overhung load adapter, which is designed with tapered roller bearings and built to stand up to the rigors of sawing limbs and trees. 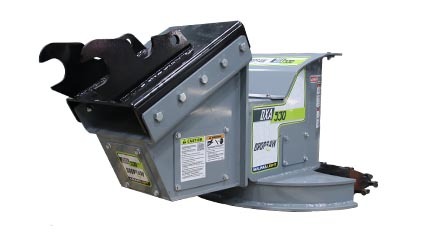 The overhung load adapter keeps the blade spinning in the toughest trimming conditions. 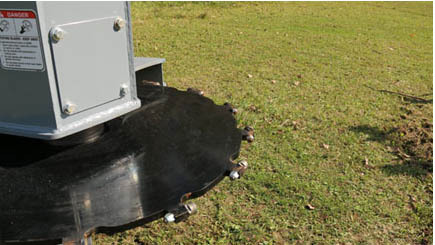 The durable shield encloses the blade for protection, directing the chips as it easily cuts through limbs and trees. 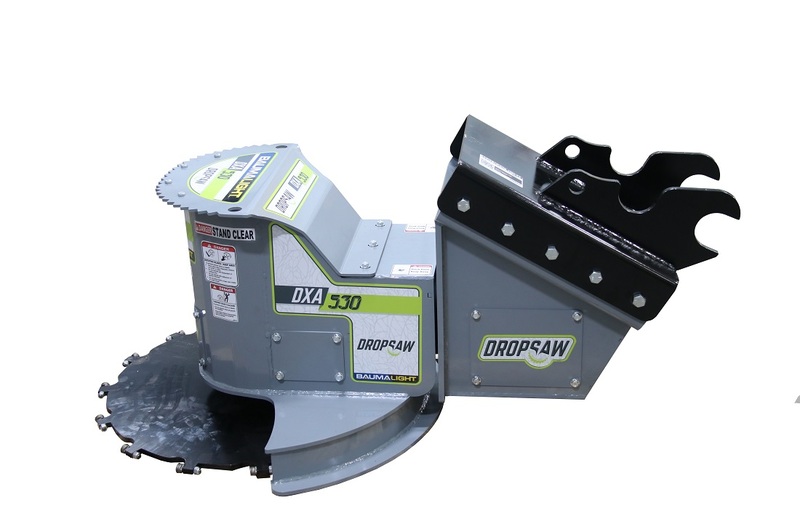 Making sure you have the best seat in the house, DropSaw was designed with maximum visibility in mind, allowing you to make cleaner and better cuts. 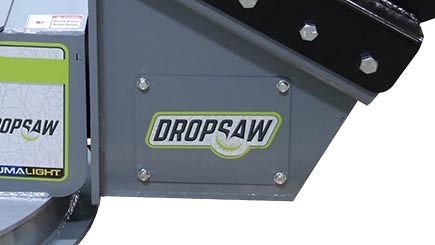 Built for the long haul, DropSaw has multiple removable panels for easier access and servicing. 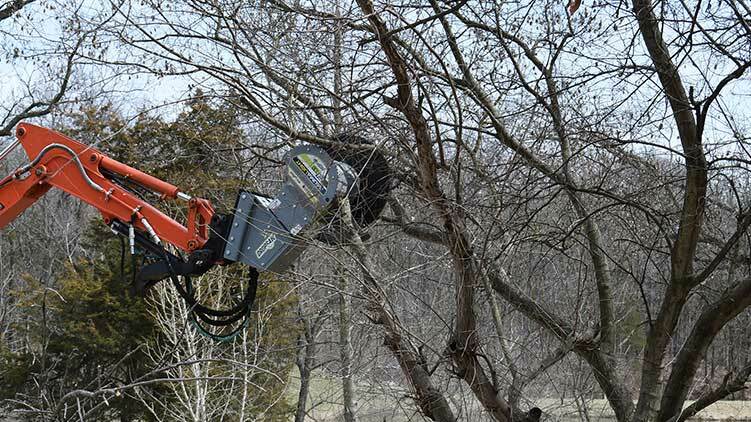 DropSaw makes clean work of limbing and trimming trees safely and quickly, leaving pruned trees with a clean cut. 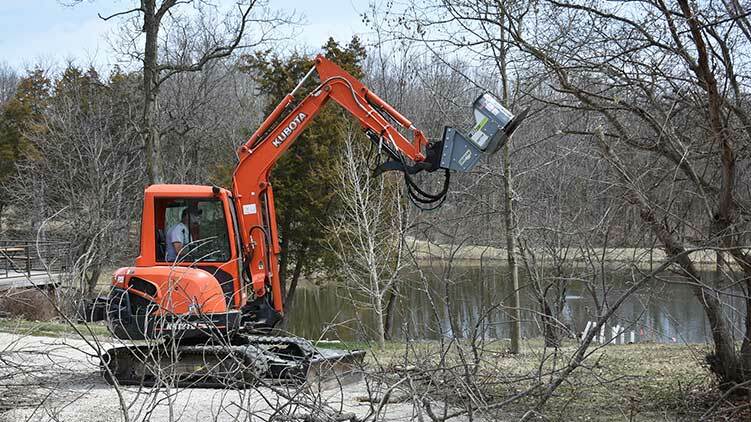 Excavators can also go where tractors and skid steers cannot, giving you and DropSaw access to areas that had to be cleared by hand in the past. 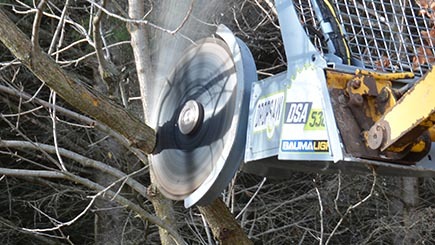 Now you can quickly and cleanly trim, limb and cut more efficiently than before. 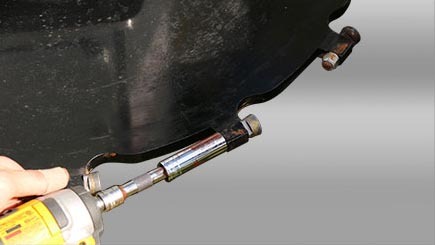 Our bolt-on mounting adaptors provide strength and future flexibility. 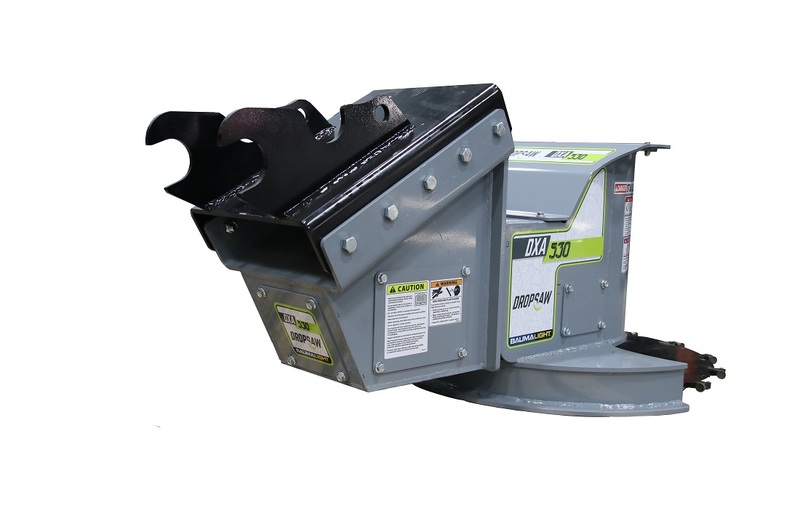 If needed, your DropSaw can easily be bolted to another adaptor to mount to your new excavator. 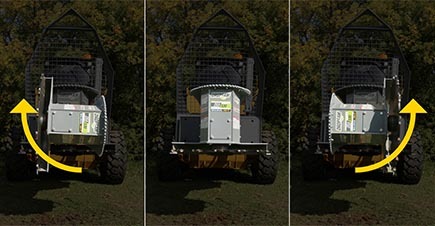 Our Industry leading bent axis piston motors make the most efficient use of your hydraulic flow and pressure for pruning, trimming and land clearing. 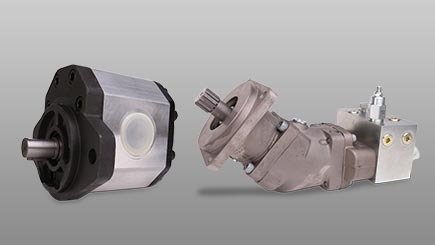 Built to last, these reliable motors can double the power of your output flow. 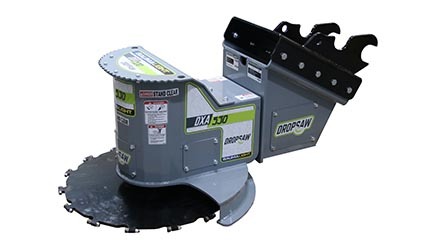 The DropSaw’s heavy duty circular blade is designed and shaped from AR-400 steel. 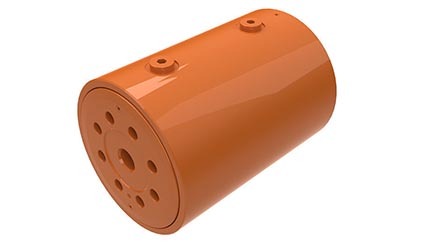 This abrasion resistant steel is rugged and ready for the abuse of a long service life. 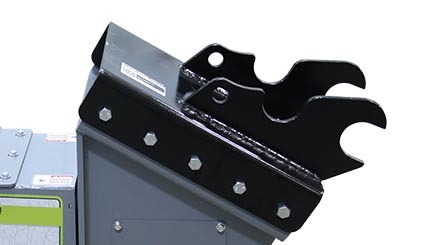 Heavy duty construction and a durable powder coated finish. 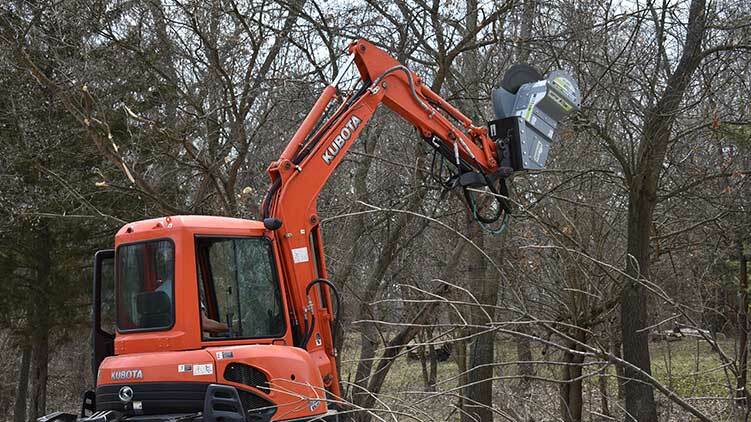 A solid serrated steel plate up front helps guide limbs, branches and small trees safely away from the operator. 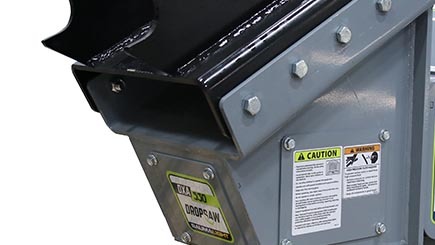 All of the hydraulic hoses on the DropSaw are sleeved for operator and hose protection while the connecting hoses are sleeved and wrapped in hose armour for double protection. The hoses are then routed internally, keeping them out of harm’s way. 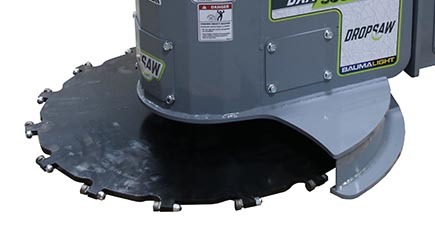 The DropSaw also features a pivoting arm with a greaseable pin keeping the slack out of the way which protects the hoses from dangerous pinching and strain. 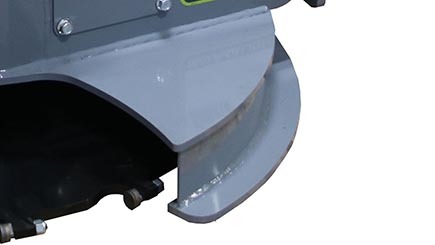 The concave shaped carbide tip provides aggressive limb and small tree sawing action by cutting through any type of wood bit by bit. Part of the secret of their performance is always having a sharp edge to make sawing easier. Sharper edges result in aggressive cutting and these round carbide tipped teeth can be rotated up to three times to provide renewed cutting performance. This gives you 3 times the wear, letting you work 3 times longer. 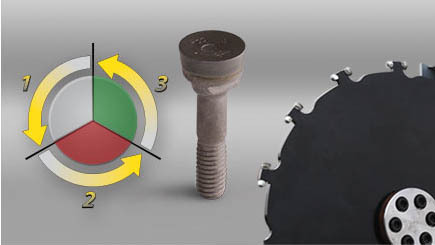 The green teeth design allows for easy rotation and changing of the teeth as needed. 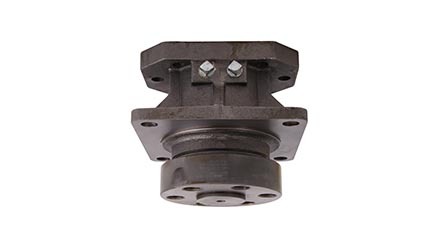 Thanks to the DSA530's rotating heliacal actuator, the head doesn’t rotate on a pin and doesn’t need greasing. Down below are photos and video footage taken by Baumalight product owners. Visit our Factory Discount web page to learn how you too can participate in this media discount program. 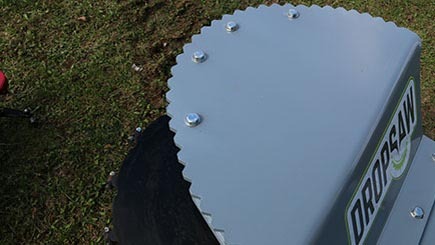 Blade Diameter 30" 30" 30" 52"
Cut Thickness 3/4" 3/4" 3/4" 1-5/8"
Max Cut (inches) 10" 10" 10" 20"
Test our pre-production and prototype models for deep discounts by giving us all the necessary feedback to make sure these models meet the requirements demanded in the field. No Warranty can be provided on labour but you'll receive deep discounts through our dealer network as well as a 1 year warranty on parts* only. Baumalight understands this is not for everyone, but our discount program offers many benefits and we look forward to providing full warranty versions in the future once all product testing has been completed. *Warranty labour must be performed by end user with no further compensation other than the deep discount off the original purchase price. With any purchase from the following list you'll have the opportunity to work with our marketing agency to obtain photos and video footage for additional discounts or if you are located farther away we give a lesser discount for high definition pictures and video footage as well.